Finding business tech support in Los Angeles is easy. Finding good business tech support in Los Angeles is much harder. Linking up with the right tech support team is critical for busy professionals. Robert Kiyosaki, the Author of Rich Dad Poor Dad, said, “Finding good partners is the key to success to anything: in business, in marriage, and especially in investing.” This article will show you the simplest way to find the right tech support partner in Los Angeles County. Here are the simplest and best ways to find great tech support. 1) Ask for Referrals- Referrals are low-hanging fruit when it comes to finding tech support. According to Nielsen, people are four times more likely to buy when referred to by a friend. As you know, good friends share good deals. The best way to discover a good tech support partner is to ask your close business friends and find someone who is 100% satisfied with their managed IT company. This effective strategy is frequently overlooked, but it often yields good results. 2) Start with Google- If you don’t have satisfied friends, start with Google over Yelp. When it comes to business tech support in Los Angeles, Google displays more relevant results than Yelp. That’s because Yelp often shows consumer IT companies, even when you’re doing a search for business tech support. These are companies that serve consumers, such as businesses that fix phones and computers. You’re looking for companies that provide internet service, managed IT, managed cloud backup, colocation, etc. 3) End With Yelp- Once you unearth a company via Google, verify their dazzling web copy with Yelp. Working with companies that have feedback (beyond the feedback on their website) is a prudent move. You’ll typically find that feedback on Yelp. Nonetheless, you can also look for feedback on Facebook or Google Reviews. Wherever it comes from, trustworthy social proof lowers your chances of getting stuck with an unreliable or inexperienced company. Sometimes Google search results don’t cut the mustard. In other words, remote companies often top local searches. Here’s why. 1) PPC Ads Target Faraway Cities- Don’t misunderstand, there’s nothing wrong with pay-per-click (PPC) ads. Many of you probably use pay-per-click ads to grow your business. The issue is many PPC ads advertise tech support businesses that are far away. This is especially true for cities in the LA suburbs. For example, we typed in “find IT services City of Industry”, and a tech support company in Irvine, CA topped the list. Of course, there’s nothing inherently wrong with working with a company that’s far 35 miles away because they may provide great value. However, all things being equal, a local tech support company will make quicker and cheaper visits to your office. Surprisingly, it’s often the “quickness” that businesses value over the cost-savings. Local companies schedule same-day consultations, repairs, installations, etc. Likewise, distant companies have to schedule on the next day more often. After all, LA has the world’s worst traffic congestion. 2) Spam Pages Target Faraway Cities- Google mostly provides good search results. Emphasis on the word “mostly.” Businesses looking for tech support in Los Angeles County need to watch out for one trick. Tech companies near Los Angeles County want to rank for as many cities in the county as possible. So, they’ll make multiple pages on their websites. Those pages will have titles such as “Tech Support Santa Fe Springs,” Tech Support City of Industry, Tech Support City of Commerce, and so on. This strategy often works because those terms don’t have a lot of competition. For instance, Santa Fe Springs is a popular manufacturing hub in Los Angeles. However, no business tech support companies are actually located in the city. So some fly-by-night tech support companies end up ranking first for these searches, simply because they have generic pages on their website targeting those cities. However, you can find companies that are closer and that have better reviews. 3) Google’s Algorithm Is Ineffective- Sometimes, city targeted pages aren’t to blame, and Google’s algorithm makes a mind-boggling mistake. For example, when we did a Google search for business “IT services City of Industry” a lot of the top results weren’t very helpful. We got results for “European auto services”, which obviously isn’t relevant. Can Directories Help You Find the Right IT Help Desk? All in all, directories are a mixed bag at best. They will display companies that aren’t easily found on Google or Yelp. That being said, they probably aren’t worth the time or effort. Still, they’re a good choice for the diligent researcher, the person who wants to leave no stone unturned. Here are the top three directories for you punctilious researchers. 1) Super Pages- Super Pages uses a different algorithm than Yelp. They tend to bring up different IT and tech companies. Unfortunately, their search engine is somewhat unrefined. For instance, we did a search for tech support in the City of Industry. The first five companies that came up were all in Los Angeles. As you can see, SuperPages isn’t great at finding local results for tech support for smaller cities in Los Angeles County. 2) Yellow Pages- Yellow Pages is similar to Super Pages. It has a nice layout. It’s pretty much Super Pages with a slightly different algorithm. 3) Manta- Unlike Super Pages or the Yellow Pages, Manta doesn’t list websites in their information technology results for the City of Industry. Websites are vital as they allow you to save time researching. Manta forces you to open up another tab, type the company’s name in, and find the company in the search results. It’s a tedious extra step. Also, Manta doesn’t seem to have a healthy number of results for this search. If you need to search a directory, use Super Pages or Yellow Pages. Nonetheless, Manta will provide interesting tidbits on a company you’re locked-in on, such as revenue estimates and employee estimates. As Robert Kiyosaki said, finding good partners is key. 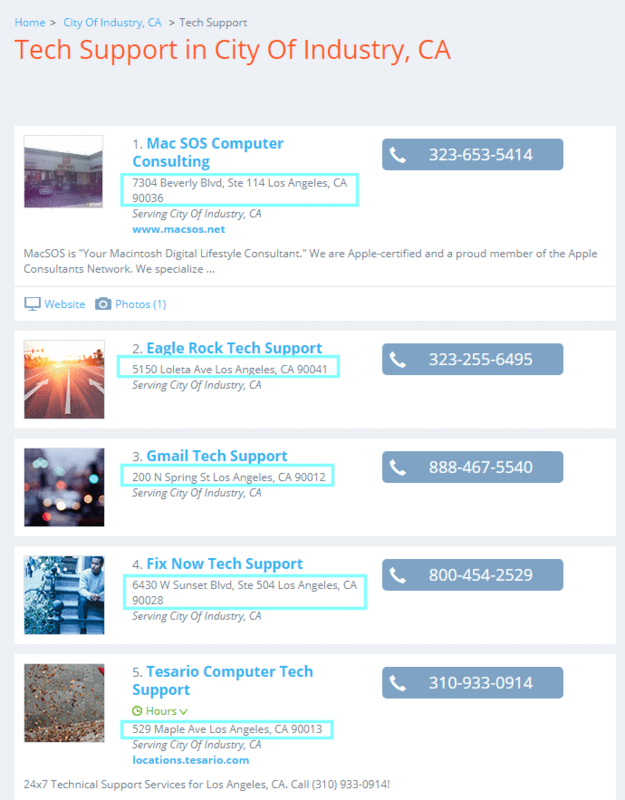 Here’s how busy professionals can find business tech support near Los Angeles. In summary, start with referrals from a trusted friend. From there, move onto Google searches. If you like what they’re saying, check out their web copy with Yelp. Speaking of Yelp, Global IT has 100% 5-star reviews on Yelp and Google Reviews. We’re in Uptown Whittier, a skip and a hop from several major manufacturing/distribution cities, namely the City of Industry, the City of Commerce, and Santa Fe Springs. We also serve large clients in Los Angeles such as the Four Points Sheraton. Global IT provides tech support for accountants, manufacturers, realtors, and many other industries. We serve all of Los Angeles County, offering our IT help desk in Temple City, Commerce, and everywhere in LA county. We provide world-class unlimited tech support at a flat rate for small, medium, and large companies. Our customers love us. Click the button and enter your info for a free consultation. Or call us at 562-698-2500. Speaking of Yelp, Global IT has 100% 5-star reviews on Yelp and Google Reviews. We’re in Uptown Whittier, a skip and a hop from several major manufacturing/distribution cities, namely the City of Industry, the City of Commerce, and Santa Fe Springs. We also serve large clients in Los Angeles such as the Four Points Sheraton. We provide world-class unlimited tech support at a flat rate for small, medium, and large companies. Our customers love us. Click the button and enter your info for a free consultation. Or call us at 562-698-2500.